Fox cartoon hit "Family Guy" on Sunday took a nice swipe at Chris Matthews marvelously mocking the MSNBCer's overly inflated ego. As the opening credits rolled, Stewie Griffin noticed that pet dog Brian has been Googling himself. After Brian explained why, Stewie remarked, "Take it easy. You're getting a bigger head than Chris Matthews." BRIAN GRIFFIN, DOG: See, I knew it was just a matter of time before somebody would recognize my genius. STEWIE GRIFFIN: Woa. Take it easy. 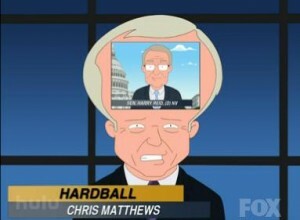 You're getting a bigger head than Chris Matthews. CHRIS MATTHEWS: The economy's in the news today, and Congress is considering a minimum wage increase. Live by satellite to talk about, Sen. Harry Reid in Washington. How about it, Sen. Reid, is this the right move during the worst recession since the 1930s? MATTHEWS: Senator, let me finish. My forehead, my rules. Let's go to Los Angeles. Big actor, played the father in "That 70s Show," Kurtwood Smith. How's it going, Kurtwood? KURTWOOD SMITH: Good, thanks for having me. Actually, that's quite like Matthews behaves on "Hardball," isn't it?